It is with deep sadness that the family of the late Elizabeth Jane Sullivan announces her passing. 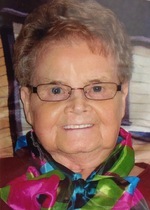 Elizabeth passed away from Copper Crescent Long Term Care Facility, Baie Verte, NL on Wednesday, March 27th, 2019 at the age of 86 years. Elizabeth is predeceased by her husband – John T. Sullivan; parents – James and Catherine Sullivan; son – Eugene Sullivan; siblings – Ronald Sullivan (Elizabeth), Jeremiah Sullivan (Margaret) and Johnny Sullivan. Left with fond and loving memories are her children – Felix Sullivan (Sharon), Loretta Flynn (Hubert), Ellen Green (Raymond), Michael Sullivan (Brenda), Linus Sullivan (Judy), Maxim Sullivan (Ellen), Maurice Sullivan, Mary Cadigan (Raymond), Marlene Hearn (Terry), Lori-Ann Sullivan (Johnny); grandchildren – Lonnie, Lesley, Lisa, Jerry, Mandy, Angela, Ian, Michelle, Frankie, Brandi, Meaghan, Robyn, Anna, Krista, Samantha, Sarah, James, William, Riley, Nikolas and Claire; 15 great-grandchildren; sister – Agnes Matthews; sister-in-law – Alice Sullivan, many nieces, nephews, and a large circle of extended family and friends. Father Camillus Ekedobe conducted the Mass of Christian Burial from St. John the Apostle Roman Catholic Church, Brent’s Cove, NL on Monday, April 1st, 2019. Interment followed from St. John the Apostle Roman Catholic Cemetery, Brent’s Cove, NL. As an expression of sympathy, flowers are gratefully accepted, or donations may be made in Elizabeth’s memory to St. John the Apostle Roman Catholic Church, Brent’s Cove, NL. Special thanks to the wonderful care our mother received from the staff at Baie View Manor and Copper Crescent Long Term Care Facility. Special thanks to Monica Saunders, Dot Wheeler and Judy Loveman for showing Mom special attention and care that she cherished.